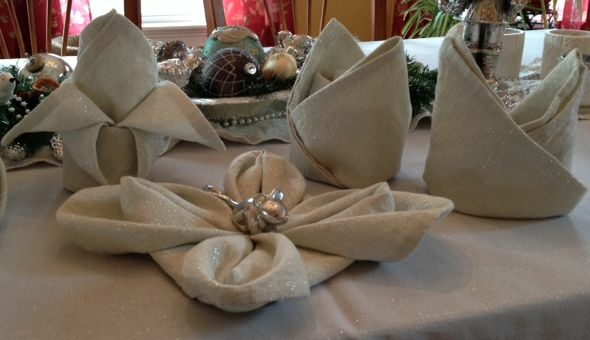 That means you have one day to copy these napkin creations before Christmas Day dinner. Haha, just kidding! I'm only trying to show off prior to ironing them. But my offer still stands: If anyone is interested sometime this winter, I'll be happy to host a "Bring your own napkins" folding class. 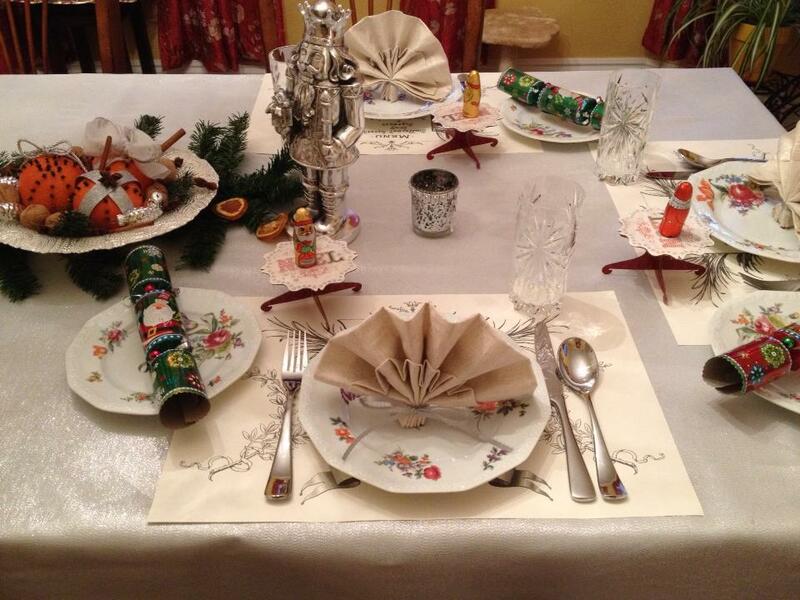 I really enjoy setting a festive table, and folded napkins just take it all to the next level. While the styles may look complicated and time consuming they are actually easy to fold, even days ahead of time. Most of the ones shown above are restaurant approved, which means they stack well and require only 3 to 4 easy steps to keep handling the napkins to a minimum in accordance with hygiene standards. 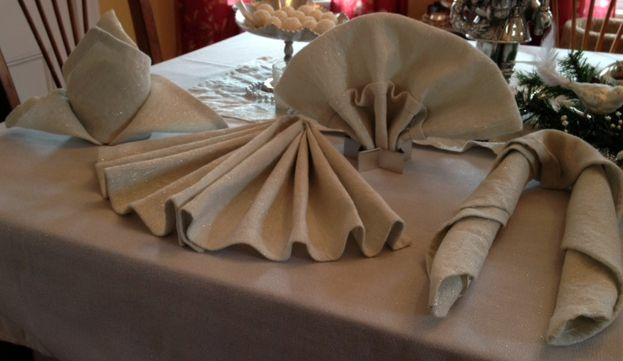 During my practical finals for Hotel & Restaurant Management, all students were required to fold 10 different, approved napkin styles. Points off if you got too elaborate. Another way to wow guests is to add cute favors to your table. For Christmas I love to put chocolate Santas or angels next to each place setting. Christmas ornaments also work very well and you can coordinate them with your color scheme. Another fun idea are so-called Christmas crackers, which are a quintessential part of Christmas parties in Great Britain and Ireland. The are available at Marshalls, Pier One or TJ Maxx in boxes of 8 or 12, and filled with little favors and colorful paper crowns (great for Selfies!!!!) They engage the guests as they help each other pull them apart. A few years ago while browsing the shops in Savannah, GA I came across a pad with 50 paper place mats. 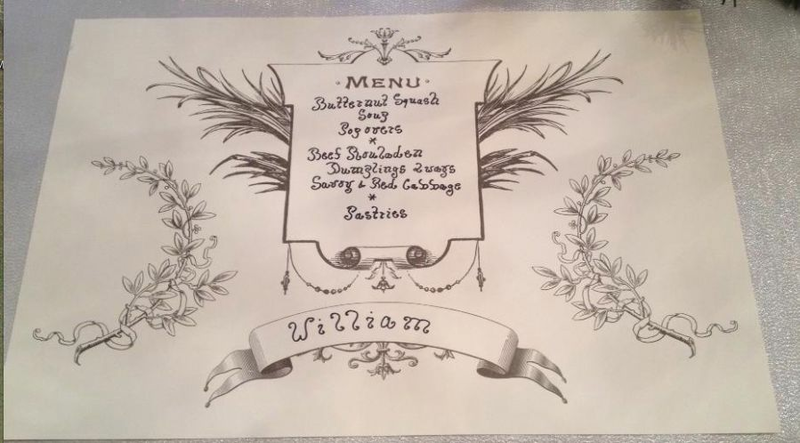 I fell in love right away because you can write the name of each guest and the menu on them, which is so cool and unexpected. It also protects the table cloth without implying "I know you are a hot mess and will spill something, so I gave you a placemat!" Lastly, dessert can be a big pain in the neck to make. You cook all day and then have to come up with some sort of sweet delicacy besides. I'm no pastry chef but you notice that I stated "Pastries" in above menu. There is a simple way out by putting together a beautiful cookie platter. Let's face it, everyone already has more than enough cookies hanging around, plus truffles and pralines galore. Add some fresh fruit and yes, the platter matters. Pick a fancy one! When arranged just so, you'll end the dinner with a bang.